The GREAT British Afternoon Tea-Off Event! 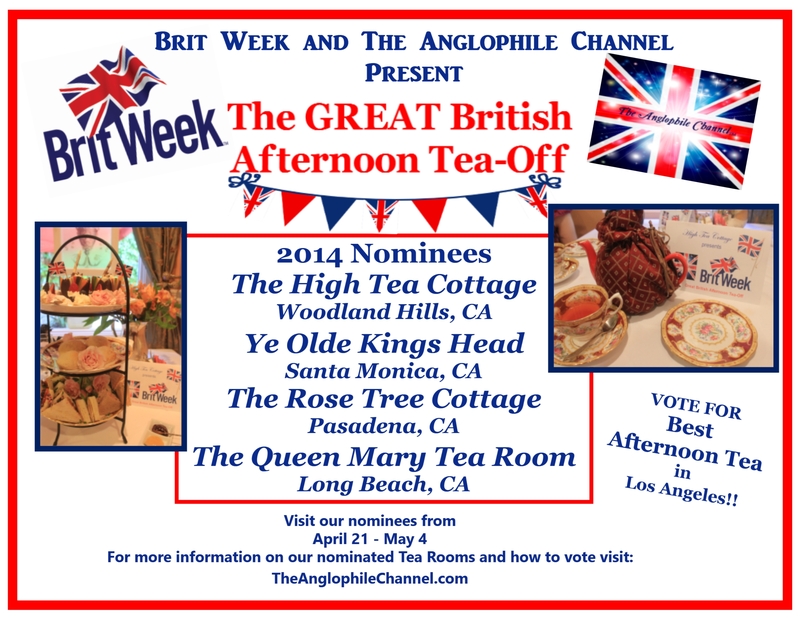 The Anglophile Channel and BRIT WEEK are proud to present the 2014 GREAT British Afternoon Tea-Off Event! Congratulations to our 2014 nominees: The High Tea Cottage (Woodland Hills, Ca), Ye Olde King’s Head tea room (Santa Monica, Ca), Rose Tree Cottage (Pasadena, Ca), and The Queen Mary Tea Room (Long Beach, Ca). We have visited each of these lovely tea rooms, interviewed the owners and sampled their Afternoon Tea, and let me tell you what a treat you have in store for you! Each tea room is unique and has its own distinct personality! We will feature each nominee in a video that introduces you to the tea room, it’s owner and shows you what sets it apart from other Afternoon Teas in Los Angeles. Videos will be posted here on our website, as well as on our YouTube channel, beginning April 22nd. We invite all of our Brit Week followers to visit each of these tea rooms during Brit Week (from April 21 through May 4th) and decide which one YOU feel offers the BEST Afternoon Tea in Los Angeles. Each of our nominees will offer a special “Brit Week” tea and/or discount during the GREAT British Afternoon Tea-Off event. After you’ve enjoyed teatime…you may place your vote HERE on our website, AND on our YouTube Channel by leaving your comment/vote below the video of your choice! The winner of our GREAT British Afternoon Tea-Off will be announced the week of May 5th! Good Luck to all our GREAT British Afternoon Tea-Off nominees! Let the VOTING begin! Pinkies up! It’s Teatime! 10 Responses to The GREAT British Afternoon Tea-Off Event! The Rose Tree Cottage is the most authentic tea house outside of England. Their tea sandwiches are to die for. Their scones are homemade daily and worth every calorie, your ta cup will NEVER run empty, and the service is “spot-on”. I LOVE everything about this place!!!! I have been to the Rose Tea Cottage. That is lovely. I don’t recall the Queen May having a Tea Room, so I must check that one out. Kings Head is certainly good for Bangers and Mash and the Woodland Hills one sounds relatively new. Look forward to hearing who the winner is, if it hasn’t been announced already.